Steve Prince had been described as an art evangelist. Together with his wall-size prints, he brings his message to the streets of Uptown. 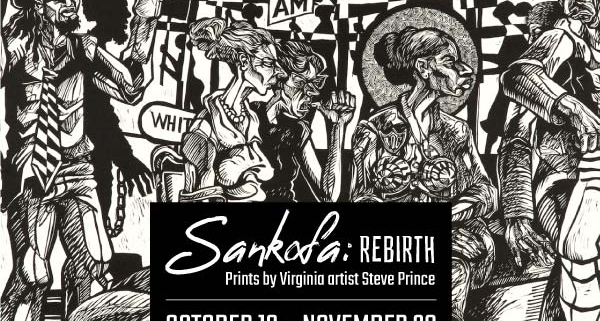 Everybody’s Coffee announces its next exhibit SANKOFA: REBIRTH, October 19 through November 28. The works are big, meant to be engaged with. “Communal Resurrection” is 4 feet tall and 40 feet long. Prince used 5-by-8 foot sheets of plywood as printing blocks that were inked and pressed into paper with a commercial steamroller—the kind used to smooth asphalt. Sankofa is a West African phrase meaning go back and get. It is about a journey toward knowledge, a look backward while moving forward, recognizing the past and at the same time hope for the future. History is evident in the themes represented in Prince’s art. The pieces in the exhibit are Linoleum Cuts, Woodcuts, and Lithographs. Steve first encountered the art of printmaking while an undergrad at Xavier University of Louisiana where he studied under the direction and tutelage of John Scott. Prince utilizes a design mechanism called “dense-pack” where he forces the viewer to encounter several things all at once, causing them to sift through the image like an archeologist to extract meaning and make sense of the controlled chaos. The art is meant to be viewed multiple times and meditated upon. An opening reception is scheduled for Friday, October 19, 6 – 8 PM. SANKOFA: REBIRTH runs through November 28. Everybody’s Coffee is at 935 W. Wilson, Chicago. Check out this interview with Steve Prince!! « A Sojourner’s Truth Book Launch!